3Dnamics innovates game-changing technology and, through rigorous science, develops novel therapeutics and medicines to fight diseases. 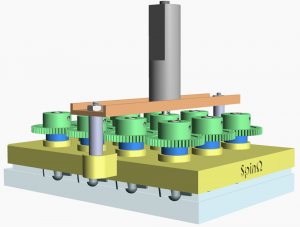 SpinΩ is a miniaturized, motorized, and modular system that is compatible with any standard multi-well tissue culture plates (12-well version shown). It provides a higher throughput platform to culture 3D tissues by reducing the amount of media required and promoting tissue survival. 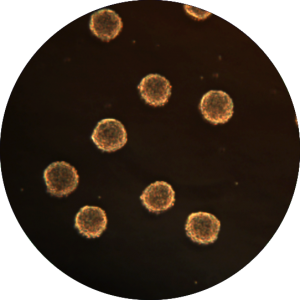 SpinΩ has proven to support the culture of human brain organoids and to be cost-effective for drug efficacy/toxicity testing. 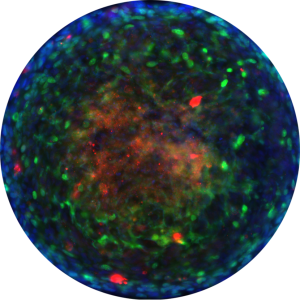 The technology was first conceptualized and developed at Johns Hopkins Institute for Cell Engineering by several talented high school student interns. 3Dnamics is further refining the bioreactor and continually inventing new tools to advance stem cell research. Revolutionizing stem cell research with exquisite and functional inventions. 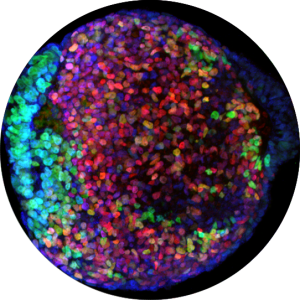 Human pluripotent stem cells can be directly differentiated into region-specific brain organoids, such as cortex, midbrain, hypothalamus, medial ganglionic eminence, hippocampus, and others with high efficiency and consistency. 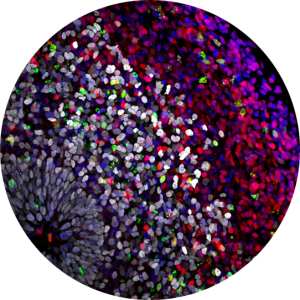 For example, cortical organoids express forebrain-specific neuronal markers and have consistent structural organization and molecular signatures throughout different developmental stages, compared to human fetal brains. These three-dimensional (3D) organoids, which are more similar to endogenous human tissues than cells grown on monolayer, are relevant models to study disease mechanism, to perform drug/toxicity screening, and to validate specific hits obtained from a high throughput screen. Indeed, the performance of cortical organoids have been successfully tested in studies of ZIKA virus infection and validation of drug hits from a larger screen (see publications below for more details). Additionally, organoids may serve as a renewable source of cells for future regenerative medicine purposes and cell-based therapeutics. The key to next generation of cell-based therapies and drug discovery. The power of pluripotent stem cells (PSCs) lies not only in their ability to become any cell types but also in their ability to recapitulate relevant disease phenotypes. Previous PSC-based studies have provided invaluable insights into underlying causes of many human disorders. 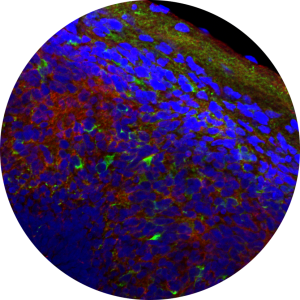 3Dnamics has developed PSC-based models for Parkinson’s, Schizophrenia, and ZIKA virus-induced microcephaly. 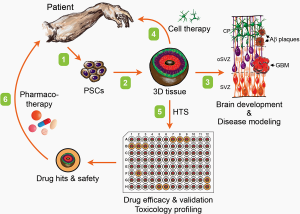 In addition to conventional PSC-based approaches, we are also developing other disease models that can be faithfully recapitulated in 3D, such as Alzheimer’s and Glioblastoma. 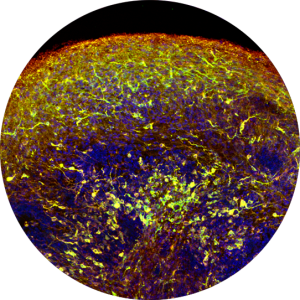 These disease models will serve as excellent platforms for the next generation of drug discovery and development. Our vision is the world without pain and suffering. Alzheimer’s disease (AD) is the most common cause of dementia and is often associated with aging and neurodegeneration. The two major pathological hallmarks of AD are accumulation of extracellular amyloid-β (Aβ) plaques and intracellular neurofibrillary tangles (NFTs). 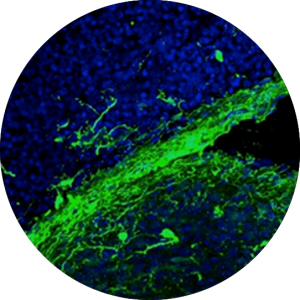 Together, Aβ plaques and NFTs can lead to neuronal dysfunctions and cell death. Currently, there are no effective treatments for AD. One of the many challenges in studying and finding treatments for AD is the lack of good existing cell and animal models that can recapitulate disease phenotype. By taking alternative approaches, 3Dnamics is determined to gain a better understanding of AD pathogenensis and to combat this devastating disease, which affect millions of people worldwide. 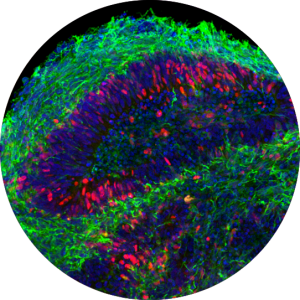 Thus, we aim to develop novel stem cell-based models and assays (conventional and 3D organoid) that can be used to unlock disease mechanism and to screen for effective compounds against AD. 3Dnamics strives to deliver the best medicines to the world. © 2017 3Dnamics Inc. All Rights Reserved.